Originating just after World War II, modern design transformed the kitchen from a utility space into a featured room in the home. Soft color palettes, clean sleek lines, & man-made materials sparked the interest of many homeowners during this time. 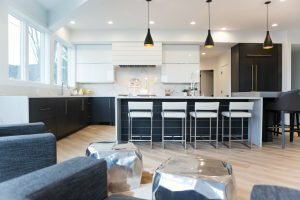 With the help of new technology and the advancements of the characteristics mentioned above, modern design has revolutionized into so much more, and is still attracting many homeowners today as well. Below are 5 features used when designing today’s modern kitchens. Sometimes called European style, frameless cabinets are built without a face-frame allowing for greater accessibility & slightly more storage space. Frameless cabinets are often paired with slab or flat panel doors creating a clean flat surface. Both the box construction and door design exemplify the “less is more” motto that encompasses modern design. 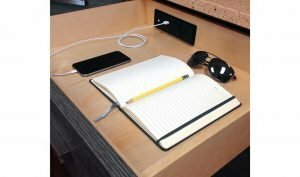 Not to say wood and natural stone can’t be used with modern design, but trends suggest man-made materials like acrylic, thermofoil, or glass cabinets, & quartz countertops are more popular due to their uniform and consistent characteristics. Metals typically play a big role in modern design as well. 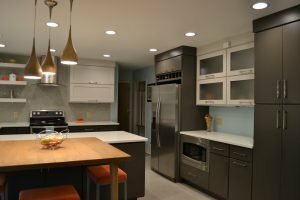 Under-cabinet and in-cabinet LED strip lighting along with decorative pendants & sleek chandeliers are all found in successfully designed modern kitchens. Not only is this type of lighting functional, it’s typically tastefully designed to be aesthetically minimal but very impactful in the overall feel of the space. 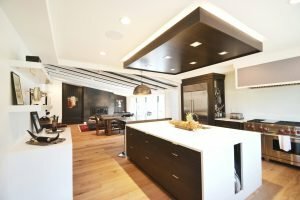 Hard lines & sharp corners, typically seen in cabinet door style selection, oversized hardware, decorative range hoods, sinks, & tile, are often used in modern design. These clean sleek lines visually stimulate the eye by leading it around the room, but interestingly enough create a simple, soothing and steady feeling throughout the space. 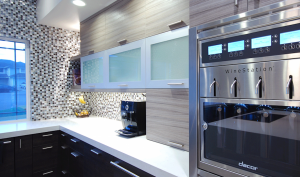 Many modern kitchens are designed with today’s modern technology. Top-of-the-line appliances, hidden electrical outlets, charging stations, & automation are now being used in modern kitchens to making home cooking easier and tastier than ever before, not to mention more functional too. To begin designing your dream modern kitchen with one of our talented kitchen designers, visit our website at liveaco.com or give us a call today @ 317.575.9540.